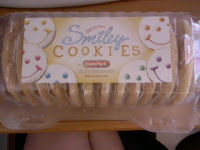 SmileyCookies! 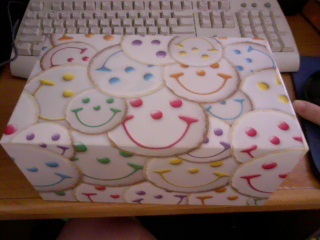 How adorable is this BOX! the box alone put a smile on my face! I love little trinket boxes and this one has to be my favorite so far! My husband and me fought over this box. And me being the sweetheart I am let him have it. haha. The SmileyCookies came in a pack of 12 assorted colors : Red,Violet,Yellow,Green,Orange and Blue. I Smelled these cookies. Don't give me that look! I'm not as a weirdo as you might think! I always smell my "Foodie" Reviews. It's not as strange as you think!. The cookies had this wonderful vanilla smell to it. The cookies came to my door perfect, not one crumble, dent, or frowny face. That's some good packaging/shipping! These are no small cookies! as you can tell in this photo i took with my SmileyCookie in my hand, It takes up almost my whole hand! I snatched one up as soon as i got the package open and i started devouring it, I got a little past half way of the cookie and was is this cookie ever going to end? lol I had to give the rest to my husband. Which he had no problem going Num, Num, Num. Good! 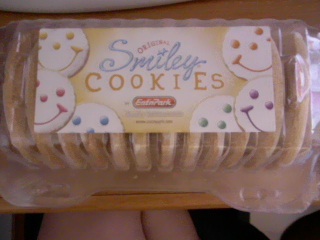 Each cookie has a bright cheery smiley on each cookie. The frosting on these cookies are smooth but very yummy! As you can see even tho i took a nibble out of it's face its still has that cheery, I'm happy to be here with you face on. If only more cookies could have such a wonderful outlook! SmileyCookie.com has special occation cookies such as : Best Wishes, Birthday, Congratulations, Get Well, Welcome Baby, Even Pittsburgh Fans! 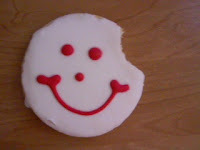 Show someone you love them buy sending them a Smiley Cookie Today! You will be glad that you did! ♥ I receive no monetary compensation for this review. I was provided Cookies to try and give my honest opinion.